C5100 POS Battery Analyzer – Aragon Instruments L.L.C. The C5100 removes the guesswork of low runtimes in a mobile phone. Testing the battery gives the user a clear assessment of battery performance in 4 minutes. Batteries are blamed for most mobile phone problems. Cheap Jerseys The fault is often outside the battery and the C5100 serves as a diagnostic tool. Customers appreciate straight answers and will return to the store having gained trust. 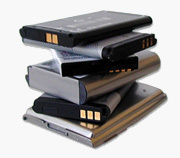 Service provides support the storefront battery testing to end frivolous battery replacements. US patent 7,622,929 in battery SoH estimation. Mobile phone users have been asking for better storefront services and battery testing fills this need in part. On a customer’s complaint saying, “my phone does not hold charge,” the C5100 may give a battery a clean bill of health, prompting to look for other anomalies, such as high current drain. Some customers may need to adjust to realistic runtimes expectations when running power-robbing apps; battery swapping won’t help. 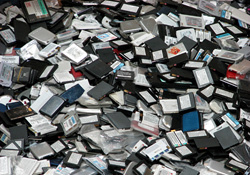 Studies show that 90% of returned mobile phone batteries can be serviced and reused. Battery refurbishing centers have sprung up that make a second life possible. 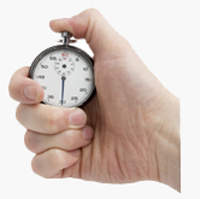 The Cadex QuickSort™ makes high-volume testing possible. Visit our C7x00 for high-volume refurbishing. The battery is the only replaceable part in a mobile phones and gets much of the blame. Replacement is often done mostly to satisfy the customer without solving the problem. Frivolous battery replacement costs the industry millions. The C5100 battery analyzer solves this with storefront service. QuickSort™ is based on electrochemical dynamic response; it achieves 90–95% sort accuracy* even with a partial charge. As modern Li-ion keeps low resistance with use, measuring the internal resistance no longer provides reliable health estimations. Three action keys make the operation intuitive: TEST checks the battery in 30 seconds; CHARGE fills a battery in 3 hours, and CYCLE provides a full charge/discharge/ charge cycle with capacity readout in mAh. As most mobile phone batteries are single-cell Li-ion; only the mAh rating needs selecting, and the arrow keys will do this. The universal RigidArm™ Adapter allows easy connection to mobile phone batteries. Spring-loaded arms lock in the upright position for quick loading, a retractable floor holds batteries vertically, and temperature sensor ensures safe operation. 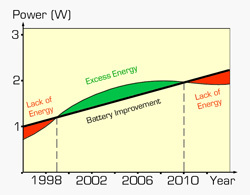 Li-ion packs often fail due to over-discharge. At about 2.8V/cell, the protection circuit opens and the battery appears dead. Boost activates the circuit and brings the pack back to life. The service lasts a few minutes, but the battery should be full charged. With storefront testing, a battery stops at the store. Servicing batteries on location builds customer confidences and protects the environment. If a battery needs charging or has a genuine fault, an alternate pack can be given from the pool of tested batteries. A typical store gets 10 batteries a day; handling is $15US per pack ($150 per day). 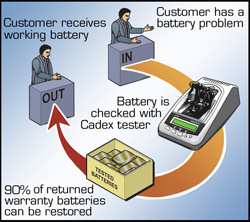 Ten stores participated for one month using Cadex battery analyzers. The trial saved close to 2,000 batteries at a cost saving of nearly $30,000. 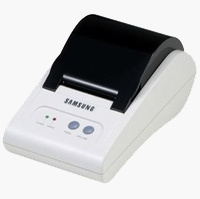 The optional printer generates test reports as customer acknowledgement. As part of the setup, PC-BatteryStore™ allows you to enter store information into the printer and customize the print format. After setup, the printer will run off the C5100 without a PC. With the insatiable appetite for information flow, new demands are place on the battery. Smartphones consume more energy than a cell phone and battery testing takes on new meaning. Cadex makes storefront service possible with proprietary rapid-test methods. 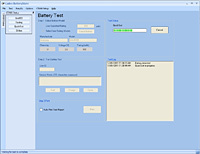 PC-BatteryStore™ software provides an extension to storefront battery testing. With a PC, you can store customer information, record anomalies and print service report carrying the name of your business. More importantly, PC-BatteryStore™ streamlines battery testing to increase customer traffic and generate additional revenue. You can record and export test results to a database and evaluate unique battery issues across multiple locations. As most batteries for mobile phone are single-cell Li-ion; only the mAh rating needs setting. The User ID identifies the person doing the test, and Service Notes enables adding anecdotes. PC-BatteryStore™ also allows downloading updates of battery types. 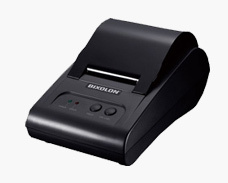 The Thermal Receipt Printer enables direct printing of small receipt and vouchers for customers after a battery test has been completed. The unit is lightweight and small which is important because of the limited space of today’s POS environments. Application Single-station lithium-ion battery tester with Quicksort™ function. Range 3.6V and 7.2V, 2A, 8W charge and discharge. Polarity protected. 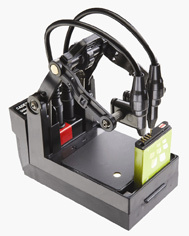 Battery Adapter SnapLock™, includes RigidArm. Also takes custom adapters, auto-scales when exceeding wattage/current setting; read-only function; temperature sensor. Aragon Instruments LLC is one of the leading distributors of test, measurement, process and control instruments in the Middle East. With years of experience Aragon Instruments provides our customers with expertise to select the products needed for your applications. © 2015 aragoninstruments.com All Rights Reserved.